Taupo teen Conrad Clark has recorded his best ever finish in the Formula 4 United States Championship at Pittsburgh despite battling with a mechanical issue. The 15-year-old was on the back foot from the start of the event after not taking part in the test day and then picking up a five-place grid penalty during Friday practice in wet conditions. A strong qualifying performance on Saturday morning saw Clark set the fifth fastest time right up until the final three minutes of the session when he was just pipped by two others in the final moments. The result helping to limit the damage from Friday’s five-place penalty. After starting from 13th, Clark made his way up to ninth very quickly before the same gearbox issue that plagued him in the previous event occurred again. The reduced speed due to the gearbox issue and the lack of green flag racing left him to settle for ninth. The second race of the weekend was again affected by mechanical issues, this time a fuel pressure irregularity caused the engine to sporadically lose power. Before the issue occurred, Clark moved up to eighth from 12th on the grid and put in a valiant effort to hold the position despite the lack of power. Following a post-race penalty for another driver, Clark was promoted to seventh-place, his best ever finish in the series. Race three was over before it started for Clark, suffering a DNF after a car spun in front of him and collected him. But Clark remains positive while gutted he couldn’t record the results he and his team deserved. “Naturally I’m gutted we couldn’t finish further up the order this weekend,” said a deflated Clark. “I think we had the pace to be on the podium all weekend but the two mechanical dramas and the crash just ruined that for us. 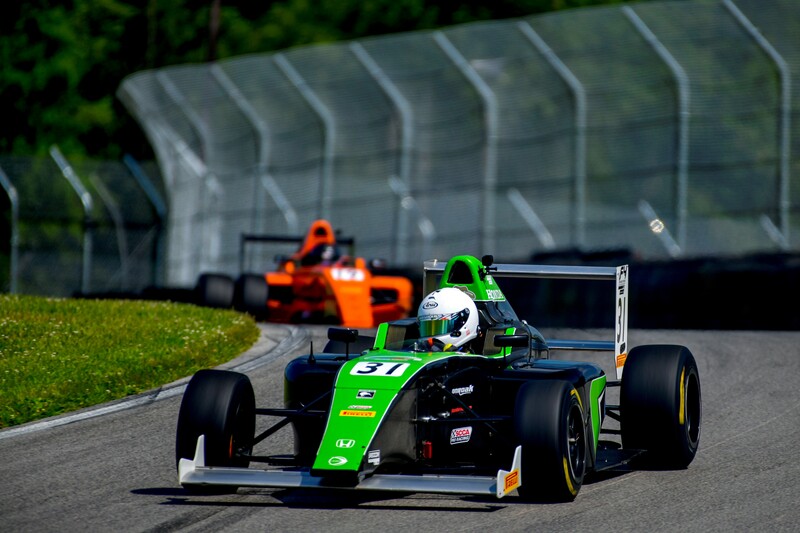 Clark returns home to Taupo this Saturday for four weeks to refresh before heading back to the United States for round six of the Formula 4 United States Championship at New Jersey Motorsport Park on September 14-16.